Mama surprised Papa with a cow share. If, like me, you had an image of a group of cows sharing their toys with one another, allow me to clarify: Mama and a group of other people paid for a pasture-raised, organically fed cow (apparently named Charlie), whose meat they then divided amongst themselves. I’m still confused, as I thought “hamburger” came from chickens. 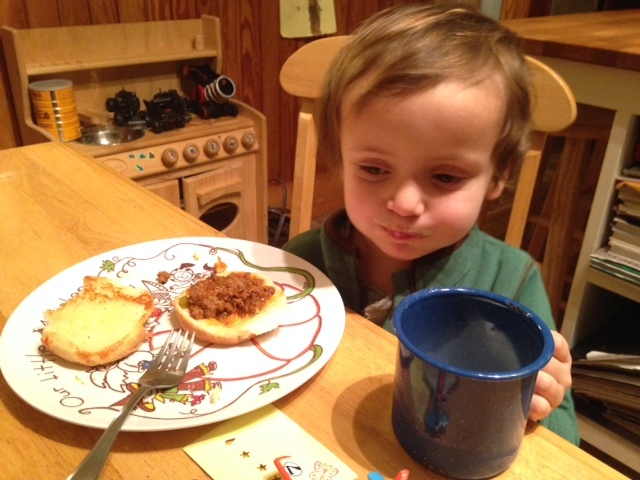 At any rate, she made what she called “Sloppy Judes,” loosely based on a Sloppy Joes recipe she found online. She thought I would enjoy eating these because they have my name in them and because I could get all sloppy without fallout. 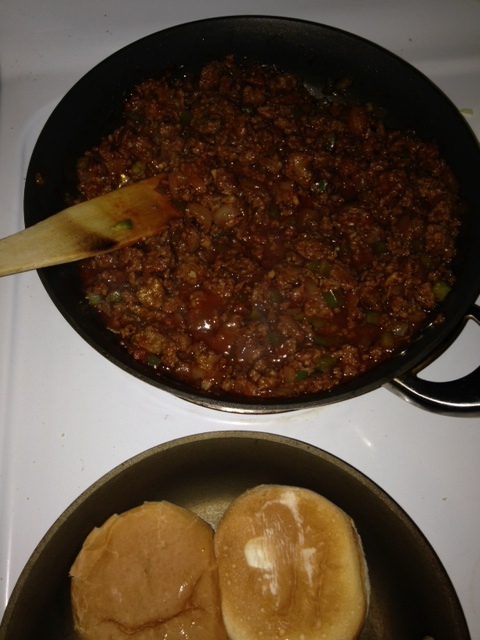 Meat mixture simmering in one skillet, buns toasting in another. Not so. I wanted to eat the bun—and not any part that touched the meat mixture, a little of which I ate with a fork. I’m debating whether I should try this as a sandwich. I think not. Even though I ate some of it, it was begrudgingly, so I’m going to give this dinner a “miss.” I just didn’t like the chopped up pepper and onions mixed in with the soft meat, and I think ketchup should be saved for hot dogs. But I like meat very much, so Papa and I are looking forward to seeing what else Charlie will provide for us. Categories: Beef, Misses | Tags: baby food, beef, cooking, cooking with toddlers, cow share, grass-fed beef, organic beef, Sloppy Joes | Permalink.